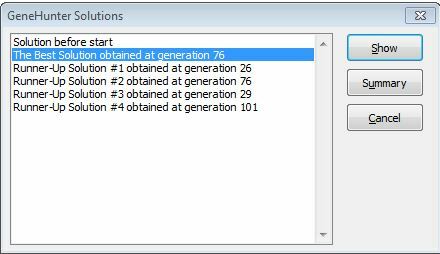 The GeneHunter dialog screen includes a Solutions button. Click on this button to display a list of the top N solutions. Click on a solution you want to view and click on the Show button. That solution is displayed in your original worksheet. Click on the summary button to save a copy of the solutions plus additional cells you select in a separate worksheet.